When I awoke it was almost silent. I mistook the settling of the logs in the fire for the rattle of leaves and twigs on the roof top. Last night’s wind and rain had passed in the night, leaving the trees a little thinner and the roof a little more cluttered. I wondered if I should put more wood on the fire, but it felt too cold to try and I was too warm to worry. The clock gently talked on the bedside table. Its echo seemed to come from the ticking of the cooling fire surround, time and energy counting down to the cool of the morning. I settled back into the warmth and slept. I was by no means late when I woke again, but it’s hard to remain asleep when somebody stands on your chest. I was about to drift off again when the small human earthquake that is my daughter climbed into bed. “Humphhh” she replies, still more than half asleep. The bed now contained two adults, two children, one bear, one hippo and a large purple unicorn. It was, too say the least, a little crowded. 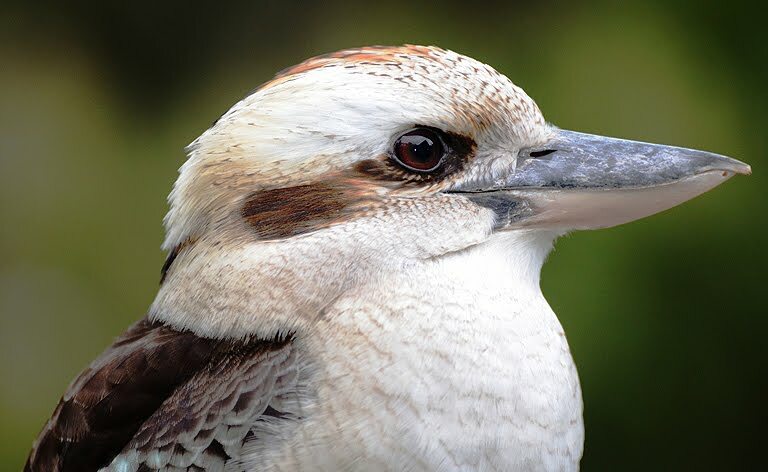 A kookaburra – the bushman’s clock – called from the balcony. It rattled an under its breath kind of call requesting breakfast. But rules are rules. The fire was long dead and I regretted my night time decision. A flat ding announces that the kettle has boiled. 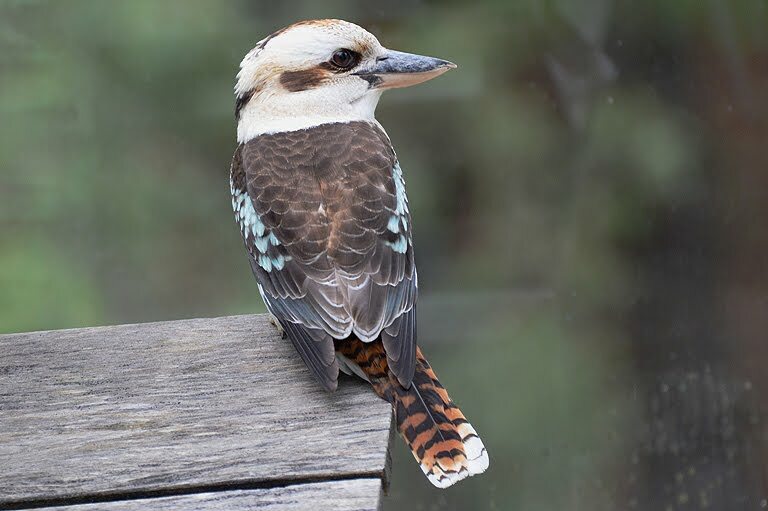 The kookaburra calls once more and is joined by another. I make tea and return to a warm but crowded bed. There is no rush. The day can wait a while. It’s a slow dawn, a pale dawn, a holiday dawn. Later that morning we walk on the beach. The sun still shines, but clouds are building in the distance. A few outliers move ahead of the pack. A different dog chases a different gull. The surfers still seem to be turning blue. After less the 24 hours I can feel the rhythm that would be possible if you could stay here, and you had nothing else to do but just be. It’s the typical holiday headset that dreams of release, brought on by the air and the surf sound, by the cloud scapes and the distant, falling horizon. The tyre noise changes from a dull wave roar to gravel top hiss. There is a faint breakfast cereal popping on the underside of the car as the loose surface of the road is spat up by the action reaction of the turning wheels. Your hands tighten ever so slightly on the steering wheel, and if you succumb to good sense, you lift your right foot ever so slightly too. Last week’s rain still runs over the road. Graded sweeps of silt lie smooth where the water pooled and put down its load. You can feel the bump rattle of ruts and tiny wash outs through the steering wheel. The tyres grab at rough spots and slip through water sheened mud. You need to concentrate. After a short while we pull into the car park and pull on coats and shoulder bags. As we are leaving we are met by an old school friend of my wife. In French films this coincidence would expand to fill the rest of the weekend, but here the collision is short lived. We walk off and I wonder if I will ever meet a school friend, by accident in a car park again: probably not. 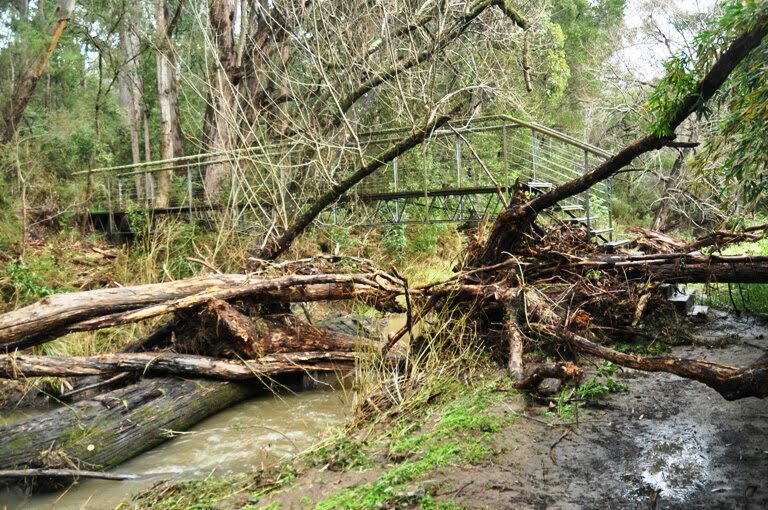 The path cuts down from the road and winds, mud deep, towards the sound of water. 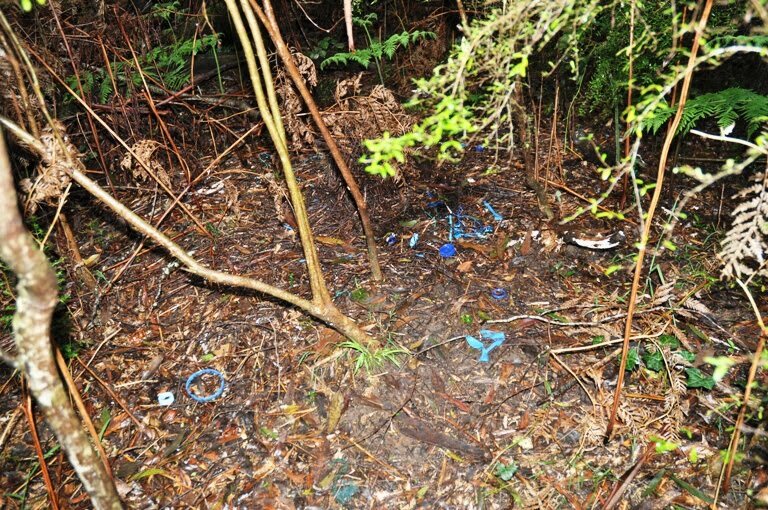 A scattering of blue objects – milk bottle tops, pen lids, scraps of plastic wrappers – lead the eye from the path towards the deeper underbrush. A Satin Bowerbird has been working here, building the avenue that runs through the centre of the decorated dance floor. This is DNA at work. Trapped inside the nuclei of the bird the DNA’s expression becomes a landscape on the river side. Where do the birds end and the bowers begin? Both are created by the imperative of DNA. Both are a function of the flow of proteins cascading within cells. The bower tells a story of generations of selection, bird upon bird, year upon year. I walk back to the path and find the same thing. The paths that run through woodland and swamp, through desert and over cliff tops are an extension of our own DNA. The repeated foot fall of people may not have made the first paths, but they keep many of them open. The need to link and communicate, this need to move between the place where we are and the place that has what we need, seems to be a basic human drive. The path leads down and along the water’s edge, a natural path that follows the flow of the water. We walk upstream, looking into whatever the river brings. The bank side plants have been combed flat by the rush of the water that closed the paths to Lake Elizabeth and set us off on Plan B. All of the stems point away from the flow, twisted into parallel lines by the force of the water, a kind of conformity to the trend of the water. Around the bridge a cushion of debris has formed. Jagged edged and uneven slabs of wood, sawn to shape but now lost to nature, stick out from the bank. Stems of bamboo form a carpet. Alien and out of place they bend as you step on them. A little way out into the flow, a tree trunk from an older flood cuts across the stream. Water piles up behind it and shoots, under pressure, beneath it to form high dimples and water crowns. Leaves circle and bob in the down flow behind the trunk, trapped, for now, by the eddy, vertical rather than flat. At a farm the path cuts away from the river and through an old orchard. 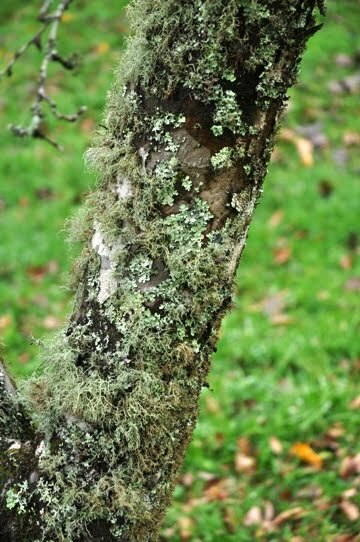 Trees bare of leaves and fruit, but heavy with lichen. A clear air place, with clean air growth. This path feels familiar, even though I have never walked it before. It’s shape and direction, seemingly random, but almost certainly not, reminds me of the paths that spider over the English countryside. Paths change direction for no reason that can be detected on the ground, but in reality follow boundaries and needs that have long since ceased to be visible. They are maintained in place by the passage of feet, the erosion of soles on the ground. If it is possible, as some have suggested, that paths hold the collective memory of all those who have walked along them, then the paths of England would sing a deeper history than many can imagine. This path, pushing away from the river, through the orchard and back towards the water, feels the same. Mud and slight streams freckle the path with interest, while down in the river bands of rocks push the water into foaming streamers. Mushrooms grow in the wet grasses and the alien trees have lost their leaves. The gums hold their leaves more tightly, and rattle in the cool wind. This is a winter walk, a walk for boots and a jacket. By its end the inner sides of my jeans will be coated in mud, just like they were as a kid when mud and walking were an everyday event, not a weekend delight. Kicking away from the river the path starts to climb. Here it becomes clear that this is not an old path at all. The sightlines of its route are straight and unforgiving of the land. One short stretch is as steep a path as I can remember, not because it passes up a rock face, or hugs the side of a waterfall, but because it just goes straight up the hill. Its path is a frontal assault on the slope, without any care for the zig zag flanking moves that would increase the length, but reduce the angle. This is not a path copied from the feet of walking people, but one made under the wheels of vehicles. 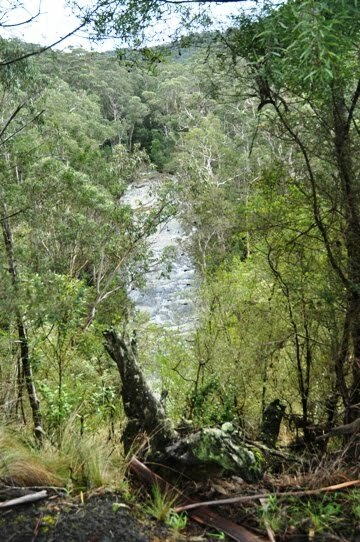 At the top of the slope you can turn and look down the length of a valley, lined with trees and busy with small rapids - riffle, pool and short rock reef and deeper pool again. We arrive at the first destination, a way station on the way to Plan B – Phantom Falls. 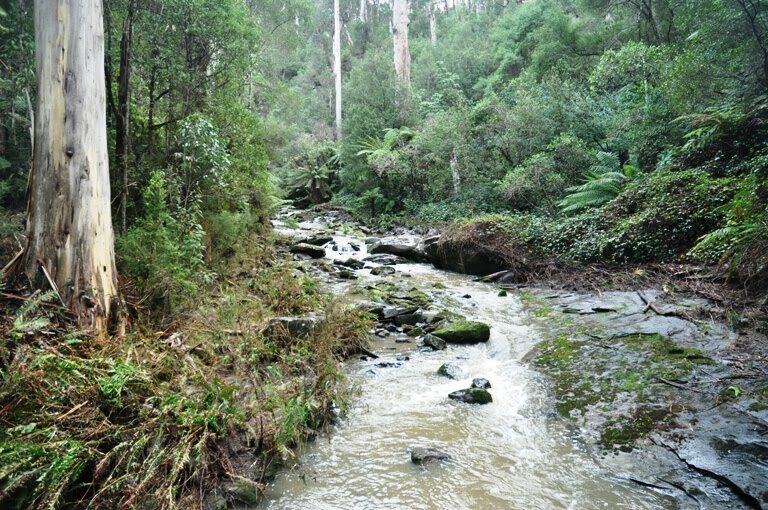 We drop down a steep path and hop over spray slick, damp, stones to stand at the base of a 15m falls. The water that robbed of us Elizabeth tumbles down here, slight brown and chill. More sticks and branches are wrapped up here, breached over hippo back rocks, stuck in the white water funnel flows that rush between the others. It’s a place of simultaneous calm and violence, the contradiction that lies at the heart of many beautiful places. Uplifting, but also a reminder of how fragile we and the things we make really are. The movement of the water seems to rob my kids of energy and spirit, and they stand stiff limbed in front of the falls. Smiles don’t seem to flow; they seem wooden, rather than fluid. They just turn and watch the water. I press delete on the camera. Now we move with the water rather than against it, downhill away from falls, away from this two thirds midpoint of the walk. Another steep vehicle track pulls away from a ford. It cuts the contours at right angles, slices across the cartographers imagined landscape in an ugly but now familiar fashion. The path is wide and well made, but it’s no pleasure to be on it. It’s a put your head down and walk path, it’s not one to enjoy and its clear the kids don’t. They walk slowly, they stop often. We produce the magic potion of chocolate biscuits and the perk up. H, map memory intact, remembers we need to grow round a sharp bend, and at the top of the hill there it is. Allen Reservoir opens out before us. Without the stamp of a royal sounding name, Allen sits in a gentle tree lined bowl. One end is blocked off with a sloping concrete wall – a perfect place to sit for a family with tired legs of various lengths. We produce more biscuits. I produce two telescopes, tripods and binoculars from my bag. Perhaps unsurprisingly, the kids pay more interest to the biscuits than the glassware. 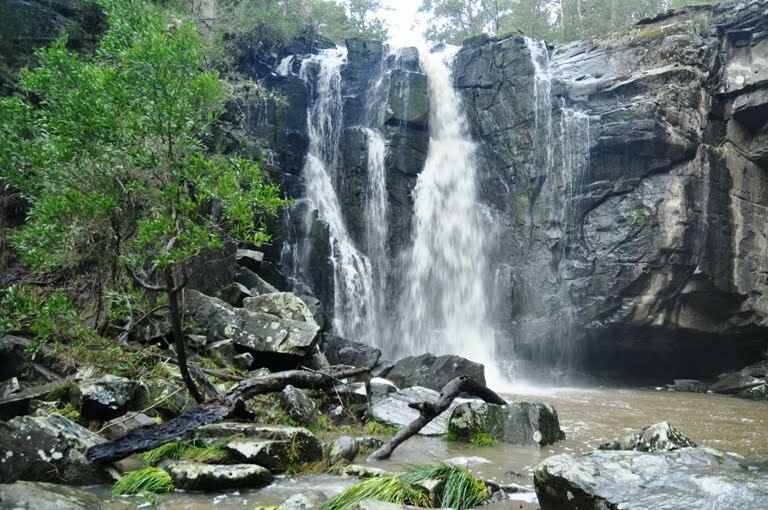 We don’t have a huge amount of time before the day starts to darken and we will need to walk back past the falls, back through the mud to the car. Coots and grebes move across the surface – a light streak on the water with a dark full stop at the end. A moving exclamation mark. We keep looking. More grebes cause a spike in the interest. Just as the kids are becoming restless, just as I am becoming restless too, I notice a line on the surface without a bird at its start or end. It is at the point that I am glad I brought my ‘scope and tripod – known, with no sense of irony, as ‘the anvil’ – along. As I focus a small brown animal dives out of sight in the middle of the field of view. “Got one” I declare. 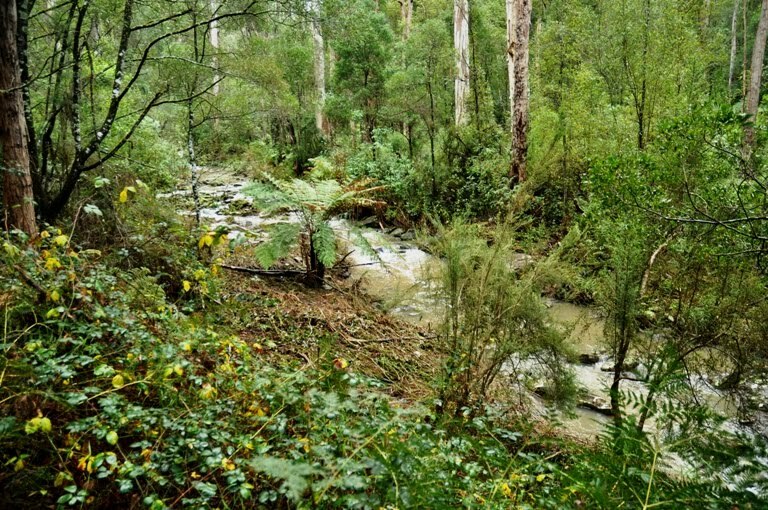 The next minutes pass too quickly as we look and find first one and then two platypus. Distant they may be, but the air is cool and clear and (for a while at least) the light is OK. You can see the bill pushing out in front, and see a quick splash as the platypus dives. On a couple of occasions I follow bubble trails in the water and see them pop back up the surface. The air cools, the light fades. We need to go. The platypus are still there as I pack, not keen to leave. I take one last look and walk away. Twenty minutes later I realise I did not take a single photograph. I just watched. I felt like I was a participant rather than an observer. Allen, my family, the platypus and me. Sometimes Plan B really is the best option. Again, you write so well, it is a joy to read and what a wonderful climax to your walk.A swimming platypus is hard to capture at dawn and dusk when they are most active. Living the wonder of meeting them in the wold is so much more satisfying. Cold and wet it may have been but not uneventful. Some images stand out - the crowded morning bed, the sometimes feeling of familiarity when you walk a new path, the put your head down and walk portion, the smiles that don't flow, the delete button, the magic of chocolate energy, and then the last 20 minutes when the naked eye and heart take in what will become a precious family memory. As hard as it is for a fellow photog to admit, sometimes the best Picts are thos that form in the head and stay as memories. Sitting on the rocky coast of Maine in the northern US, the sight of a red moon over Monhegan Island is one such memory photo for me. Great post. As always. re: Your last para. I saw a gyrfalcon worrying geese in Iceland. I never lifted the camera from my chest. As RBenz says - sometimes the pictures in the memory are the best ones. Such a beautiful day -- right from the lovely beginning of it. I'm so glad you saw the platypuses (platypi?). You are creating such beautiful family memories. I love reading your descriptions of your walks. They fill in the blanks so I can tag along with you. The sounds, the textures, the feelings, those special family moments all gone to quickly but the words will be remembered for ever. Beautifully written, Stewart! I have a mental picture of all you describe, as if I was there taking the walk with you and your family. Lovely images too! That Kookaburra is brilliant!! From here the world looks like a map.